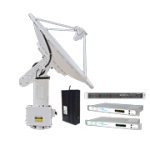 For customers that want the convenience of a pre-configured solution that is installed and running in a short timeframe, Orbital Systems has designed system bundles that match the requirements for science research and meteorological applications. The typical timeline from initial purchase to an operational system is four months. Reception loss caused by what is sometimes called a “keyhole effect” is eliminated by the high speed of azimuth rotation in Orbitals’ two axis products. When tracking a near overhead pass the 2.4m through 3.7m products use a predictive motion with a peak azimuth velocity of 60 degrees/sec, and acceleration at up to 60 degrees/sec². The 1.8m product does these motions at up to 50 degrees/sec. 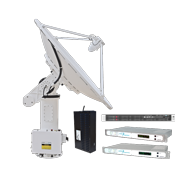 These very high speeds completely eliminate loss of signals on a worst case near overhead pass in X-band and below. Orbitals’ 5m positioner utilizes three axis tracking to reduce the worst case maximum tracking velocity requirement for a Low Earth Orbit (LEO) to about 7 degrees/sec allowing use at any practical frequency.